Jacob was named to the Associated Press First Team All-State for the 2013 season as a quarterback. He was also named to the Detroit Free Press First Team All-State, Detroit News First Team All-State, Lansing State Journal Class A All-Area as well as CAAC Red Division All-Conference quarterback. Johnson is the first DeWitt player to be named All-State as a junior. Jacob was injured late in Week 6 against St. Johns yet came back in the first week of the playoffs to lead DeWitt to a berth in the Division 3 State Finals at Ford Field. With a stable of excellent receivers to pass to, the strong-arm passing Johnson completed an impressive 68% of his 176 passing attempts with only three interceptions. His season stats; 119 completions for passes for 2,039 yards and 31 touchdowns. Jacob also ran for just over 600 yards and a touchdown. Three different receivers had over 30 receptions. Jacob was the latest in the line of outstanding quarterbacks to play for Coach Rob Zimmerman. He was the first to start three seasons as the number one quarterback. 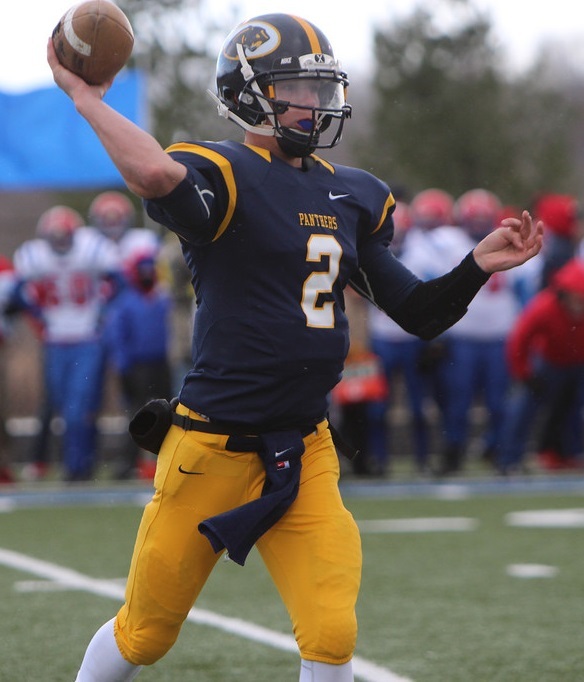 Jacob’s sophomore year was also a short one due to a broken throwing hand, passing for 1,243 yards and tossing 16 touchdowns in six games, helping DeWitt land in the state semi-finals. Update 2014: Jacob Johnson also had an injury missing much of his senior season yet passed for 662 yards and five touchdowns in five games. For his career, Johnson was 262 of 439 passing for 3,945 yards and 52 touchdowns and only 12 interceptions. Rushing, Johnson had 215 carries for 1,370 yards and ran for 11 touchdowns. He was named Honorable Mention quarterback his senior year by the Detroit Free Press, Lansing State Journal Class A All-Area and CAAC Red Division All-League. Jacob will continue his football career at Central Michigan University. .